In a 100-year-old barn on their 5-acre farm near the Canadian border in Blaine, the Smith family is crafting French and Belgian-style farmhouse ales with raw ingredients they harvest from the fields that surround them. Their Old-World style stands apart in the IPA-centric beer scene and the balanced flavors of their ales, saisons, stouts, and open fermentation wild beer are gaining local – and national – attention. 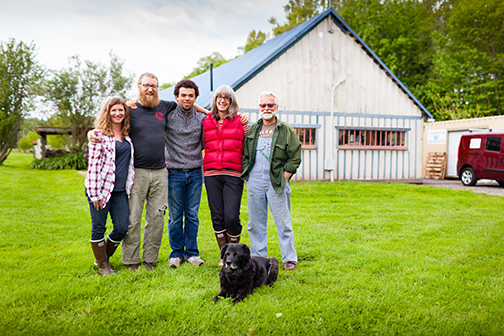 The Atwood Ales family: Monica Smith, co-owner, director of sales, marketing and distribution; Josh Smith, co-owner and head brewer; Xavier Felmley, son; Leslee Smith, co-owner; Stephen Smith, co-owner and farm manager; and Keera, brewery dog, in the front. Photo courtesy of Monica Smith, Atwood Ales. While a handful of North American breweries are producing farmhouse-style beer, there are very few actual agricultural farm breweries like Atwood Ales. It’s a brewing tradition that dates back centuries to European farmers who turned raw materials into beer to quench the thirst of farm workers harvesting the fields. Farmhouse ales’ distinctive style was a catalyst for brewer Josh Smith, who co-owns the family brewery with his wife, Monica, and his parents, Stephen and Leslee. Atwood is the middle name of Josh, his father, his grandfather and now their brewery because “frankly, it’s a lot more interesting than Smith Brewing,” Josh said. Josh and Monica met when they both tended bar at the now-closed Maggie’s Pub in Ferndale. They laughingly credit beer, counseling and conversation for figuring out how to successfully combine a new marriage, a new business, and a multi-generational household that includes their son, Xavier Felmley, underneath the family farm’s sky-blue metal roofs. Along the way, he was trying to figure out how to open his own brewery. Eventually, the quest led back to his family’s farm on Sweet Road. Some time around 2015, Josh asked his dad, “What about out here?” The answer: I was wondering when you were going to ask. 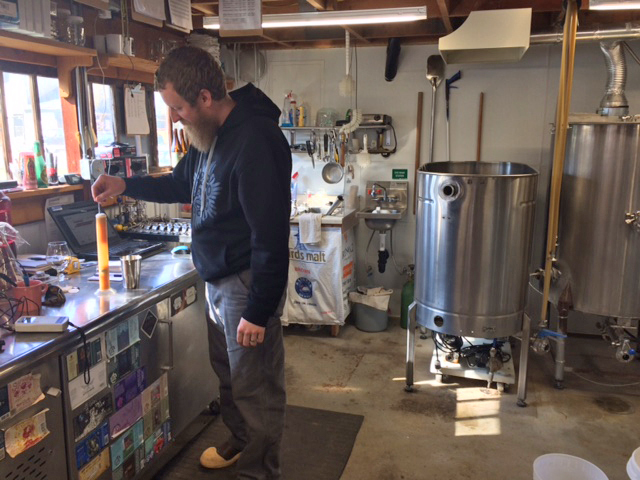 With the location secure, Josh searched for stainless steel tanks on Craig’s List and at Z Recyclers and enlisted a friend who is a welder to build his custom two-barrel brewhouse system. On rotation in the small-production brewery are their regular offerings of farmhouse ales, saisons, stouts and session ales as well as seasonal blends and experiments inspired by the land. 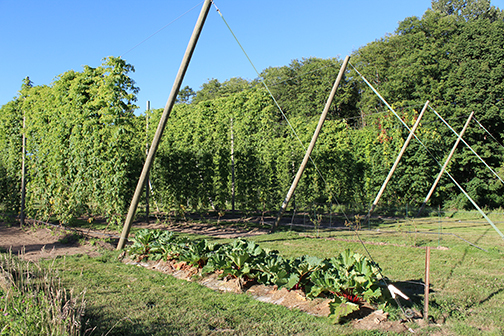 Just steps beyond the brewhouse’s barn door, they grow five different varieties of hops as well as berries, fruit trees, herbs and vegetables, which are harvested and added to the beer for aroma and flavor profile. The Smiths also forage wild plants to inspire blends such as Stinging Mo’s, a saison with nettles, and incorporate oysters from Drayton Harbor just two miles west of the brewery for their Dark Harbor oyster stout. Local beer drinkers and judges at food competitions say their beers are balanced and approachable. Atwood Ales’ triticale won a bronze medal at the 2018 New York International Beer Competition and their rhubarb sour – flavored with 100 pounds of rhubarb harvested and processed on the farm – is a 2018 Good Food Award winner. In addition to the seasonal harvest, Atwood Ales beer styles reflect memories of drinking beer with friends. “There is nothing better than sitting around a table with a group of people drinking beer and eating good food to create a sense of community,” Monica said. To build an appreciation of their beer, they collaborate with local chefs and other brewers from Whatcom County’s brewing community. Their Bellingham Farmers Market booth serves as their tasting room for the public. And Monica visits locations from Vancouver, B.C., to Tacoma that sell their beer, leading combination tasting and farmhouse ale history lessons for staff and inviting bottle shop owners, restaurant staff and others to come out to the farm. They may open a tap room in Blaine one day as well as expand hops and other crops to additional acreage. Their current project is to streamline and expand the brewhouse space for efficiency to increase production from 88 barrels of beer in 2017 to 100 in 2018. 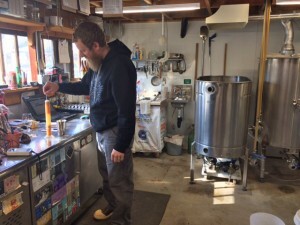 Even with those improvements, Atwood Ales will still be a boutique brewery; compare their output to larger breweries in Bellingham which produce thousands of barrels annually. They rotate their 12 kegs with priority to bottle shops and restaurants that also sell their traditional 500 milliliter and 750 milliliter bottles. The slow growth reflects the beer style itself. “We want people to appreciate and understand our beer,” Monica Smith said. After all, it’s part of an old story about taking a break to sip and savor the land around us. If you go: While they don’t have a tasting room on their farm property in Blaine, Atwood Ales regularly offers small group tours by appointment. They also host private parties. Learn more about Atwood Ales, including where to buy and upcoming events, at atwoodales.com. Or try a sample and buy a bottle at their Bellingham Farmers Market booth.